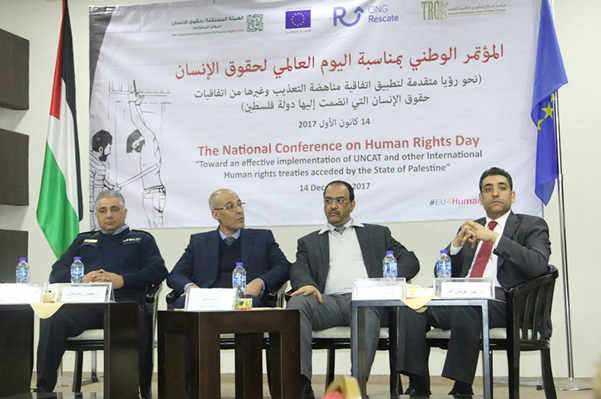 On December 14, 2017, the Treatment and Rehabilitation Center for Victims of Torture (TRC) in collaboration with the Independent Commission on Human Rights (ICHR) held the second annual National Conference commemorating the International Human Rights Day. The Conference took place from 9.30am to 1.30pm at the Palestinian Red Crescent Society (PRCS), Conference Hall, Al-Quds St., Ramallah. The overall theme of the Conference was: “Towards an effective implementation of the United Nations Convention Against Torture (UNCAT) and other International Human rights treaties acceded by the State of Palestine”. The Conference was an opportunity for the participants to understand the current situation, challenges and advancements relating to torture in Palestine and the implementation of the UNCAT into national legislation. It was with great pleasure that around hundred lawyers, civil society organizations, international organizations and governmental departments, such as police officers and national security officers and last but not least around 10 victims participated in the Conference. Upon arrival each participant was registered, and provided with a folder which included several brochures from the TRC and the ICHR. This year’s opening speeches was given by Dr. Mahmound Sehwail, the CEO of the TRC, and Dr. Farshen Shahen, a delegate from the ICHR. The main objects of the first session was to state the current obligations of the State of Palestine, to present methods in preventing torture, and to advocate for need to sign and ratify other relevant treaties in protecting human rights in Palestine. The first session, moderated by Dr. Mohammed Shahen, was opened by Dr. Omar Awadallah, the multilateral relations assistant of the Palestinian minister of foreign affairs, who spoke about the obligations of the State of Palestine under the acceded international human rights treaties. The second speaker, the Attorney General Dr. Ahmed Barrak, presented modern methods of preventing torture under prosecutions. Next, Colonel Hatem Ajaj, the head of the social and psychological unit at the Palestinian correctional facilities, presented the successful measures that they have taken in order to prevent torture and ill-treatment. The first session was closed by Mr. Khader Rasras, a member of the Palestinian Coalition Against Torture, reviewed the joint interests and necessity to sign the Optional Protocol to the Convention Against Torture (OPCAT), adopt the Istanbul Protocol, and to activate Article 22 of UNCAT, he further affirmed that acceding and ratifying human rights treaties is a very good step that reflects the human rights-orientation of the Palestinian people. The objective of the second session was to provide an overview of the current situation and challenges with regards to torture in Palestine. The session, moderated by Dr. Majed Arouri, was opened by Dr. Omar Rahhal, the general manager of SHAMS. Dr. Rahhal discussed the importance of the role of advocating and raising social awareness about protecting human rights in Palestine through media. The second speaker, Mr. Johen De Vilda from OHCHR in oPt, introduced legislative correction measures that should be worked on to ensure the prevention of torture. Following Mr. De Vilda, Mr. Mousa Abu Dhiem from ICHR provided a comprehensive overview of the indicators and outcomes of torture in the State of Palestine in 2017. The second session was closed by Wisam Sehwail from TRC. Mr. Sehwail gave the participants an insight into the psychological consequences for victims and the society that derives from institutionalized torture. The day ended with great entertainment show “Dabkeh” from “Khaleha Falastiniya”, following networking and lunch at restaurant of the PRCS.